Andrea Rosen Gallery is pleased to announce The Temptation of the Diagram, a group show organized by Matthew Ritchie, at our new Gallery 2 location. Ritchie has been represented by the gallery for almost fifteen years, and we are thrilled to present his first curatorial endeavor at our space. 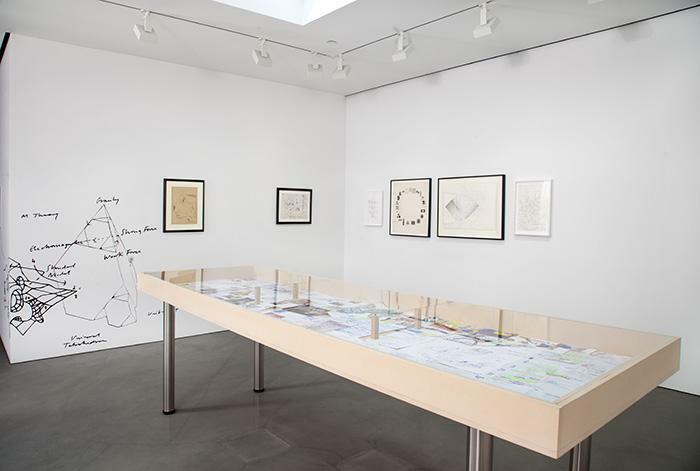 The exhibition explores the diagram as an essential mode of artistic practice and expands on themes Ritchie researched and considered as an Artist in Residence at the Getty Research Institute in 2012 and currently at Columbia University. In Flaubert's 'The Temptation of St Anthony,' the tortured hermit, besieged by an encyclopedic parade of gorgeous visions, finally calls out: "Somewhere there must be primordial figures whose bodily forms are only symbols, could I but see them I would know the link between matter and thought; I would know in what Being consists!" It is the last, impossible temptation. As Susanne Leeb writes: "diagrams escape the insoluble dialectic of absence and presence which pervades the play of representation, yet…diagrams have no status in art per se." In art historical terms, the diagram is both refuge and refugee, a universal visual bridge between the written and the seen, but without a home in either. 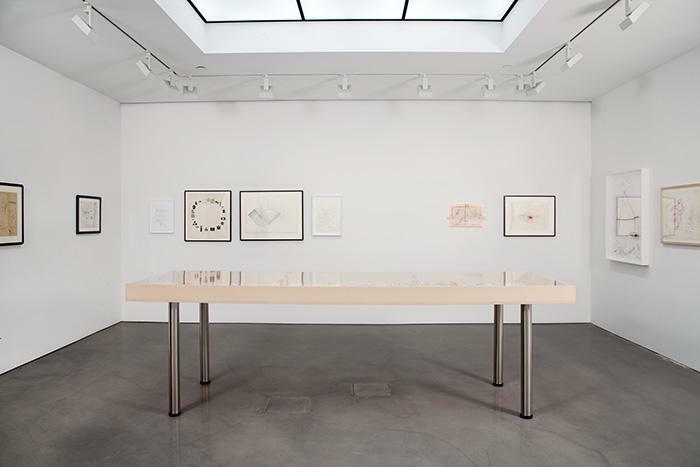 This modest exhibition is not a history of the diagram but an organization of compelling examples of a specific kind of diagram, hand-made diagrams that occupy the impossible space between idea and reality. Perhaps they can somewhat counter the residual presumption that thinking runs counter to aesthetic contemplation; that intelligence is not beautiful. Perhaps we can see these diagrams as the artists do, central to their thinking about art-making. Diagrams are, as Leeb puts it "A tool for the making of relationships and for the abandonment of rational procedure." For the anchorite saint, this desire, "to assume all forms - penetrate each atom – be matter itself" is the final and irresistible temptation, the ultimate dream of the artist. Diagrams are the nervous systems of artists working with their skin off. In the presence of diagrams, the profound questions of symbiosis between image and text, scale and distance, proximity and imagined immunity that define our use of any shared informational space are all too painfully evident. That is not to suggest the diagram constitutes an easy escape route, or a trap door for the visionary. Although for artists it may be precisely the progress their work makes away from the original index of reality that constitutes its true 'sensual objecthood,' diagrams ultimately reference an operable (if imagined) dimensionality. Diagrams, seen and hidden, constitute the pivotal means for commutation between the multitudinous spaces of prediction, memory, fantasy, language, metaphor and instruction. If all this seems romantic, it is. The diagram is a trace of our collective efforts to articulate and negotiate an almost impossible circumstance: reality itself. Imagine a single dimension, a point. Add a line. Now add an arrow to the line, a vector. Can you imagine another dimension? Go ahead. Add another line, another and another. Now add arrows to all those lines. More! Are they all going in the same direction? Impossible! "The movement is everything, the final goal nothing." Matthew Ritchie's installations, which integrate painting, wall drawings, light boxes, performance, sculpture, and projections, are investigations of the idea of information explored through science, architecture, history and the dynamics of culture, defined equally by their range and their lyrical visual language. In 2001, Time magazine listed Ritchie as one of 100 innovators for the new millennium, for exploring "the unthinkable or the not-yet-thought." His work has been shown in numerous exhibitions worldwide, including the Whitney Biennial, the Sydney Biennial, the Sao Paulo Biennial, the Venice Architecture Biennale, the Seville Biennale, and the Havana Biennale, and is in the collections of the Museum of Modern Art, the Guggenheim Museum, the Whitney Museum of American Art, the Albright-Knox Museum, the San Francisco Museum of Modern Art and other institutions worldwide, including a permanent large-scale installation at MIT. He has written for Artforum, Flash Art, Art & Text, and the Contemporary Arts Journal, and is a contributor to Edge. In 2012 Ritchie was Artist in Residence at the Getty Research Institute, Los Angeles. Ritchie is currently Mellon Artist in Residence and Adjunct Professor in the Graduate Visual Arts Program at Columbia University, New York, where he has organized two public workshops this spring to examine how we can extend understanding and use of our new, current dimension – where every image in history can be seen at once, every idea can be communicated, rebutted and digitally reformatted, and every space can host any form of presence – in the shared space of culture. The next workshop, Art, Information and Networks, will feature Albert-László Barabási and Caroline Jones, moderated by Matthew Ritchie, on April 19 at 6 PM at Columbia University. It is free and open to the public; for more information, visit arts.columbia.edu. Ritchie will also take part in Rhizome's Seven on Seven conference in April. Andrea Rosen conceived Gallery 2 in 1999 as a liberating arena in which to consider new ideas and create parallel perspectives to the Gallery's primary program, and as a means of fulfilling the Gallery's responsibility to broaden visual references and education for its audience. An inspiring and highly important part of the Gallery's exhibition program, Gallery 2 was formerly located adjacent to the main gallery at the 525 West 24th Street location, prior to the recent opening of separate Gallery 2 space at 544 West 24th Street. 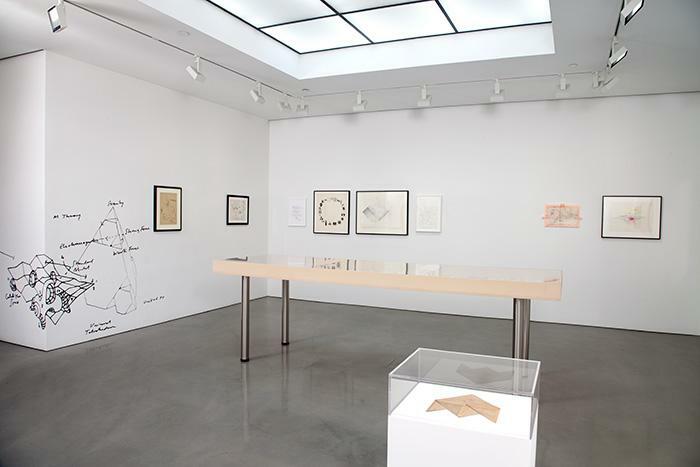 Gallery 2 has developed a reputation for significant historical exhibitions, presenting first-time, one-person shows, and shedding light on lesser known aspects of prominent artists' practices. Many of the shows conceived in Gallery 2 have gone on to have other lives in other exhibitions and institutions. The program affords the Gallery the opportunity to work with young artists who might not otherwise not have the opportunity to show within the primary space as well as esteemed independent curators and art historians. Andrea Rosen Gallery has been built on the ideals of what it means to represent a specific group of artists over a very long period of time, but it has also come to realize that infusing the gallery with one-time projects enhances the vocabulary, meaning, and impact of the gallery's agenda.